Accepta 2651 is a high-performance, multi-functional reverse osmosis antiscalant and antifoulant scientifically formulated for the treatment and protection of reverse osmosis (RO) membranes, nanofiltration (NF) and EDR membrane systems. Accepta 2651 can be used in the production of drinking water and in seawater desalination process applications and is highly effective in preventing the build-up of calcium carbonate scale on reverse osmosis, nanofiltration and EDR membrane surfaces. Besides its excellent calcium carbonate scale inhibition properties, Accepta 2651 is also effective at controlling calcium sulphate, calcium fluoride and metal oxides scale. Accepta 2651 can be used in the production of drinking water according to NSF standard 60. The maximum allowed dose rate is 10 mg/l. Accepta 2651 should be injected in membrane systems after chlorine and sodium metabisulphite treatment. Accepta 2651 can be used in the production of drinking water according to NSF standard 60 where the maximum allowed dosage rate is 10 mg/l. Accepta 2651 is not compatible with residual cationic polymers from the pre-treatment. The dosage level of Accepta 2651 is dependent on the quality of the feed water and the saturation indices of the various scales forming species present in the concentrated brine. 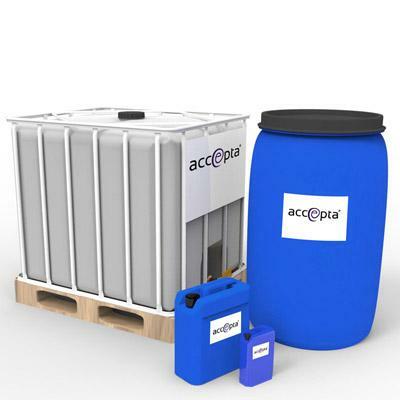 Dosage levels of Accepta 2651 when used in seawater desalination applications should be calculated using Accepta’s specialist software, for further support and information please contact Accepta. Recommended injection point is into the feed water, downstream of any filtration equipment and cartridge filters. Accepta 2651 is miscible with water in all proportions. It may be applied as neat product, or as a solution in permeate water. A minimum dosing solution strength of 10% is recommended. This product should be dosed continuously and proportionally to the feed water flow. For further technical assistance concerning Accepta 2651 please contact Accepta.